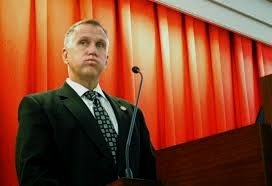 Does Thom Tillis appear to be flailing to you? Wind-milling those arms of his in an attempt to connect with something -- anything -- that might resonate with the voting public ... and hitting nothing but soggy air. Tillis wants to modestly raise teacher salaries by spending more money getting us all to buy more lottery tickets. No, really. The Tillis budget proposed by the NC House would increase advertising for the NC Lottery substantially in order to fund the raises for teachers. But officials with the lottery warned legislators that doubling the advertising budget for the lottery still wouldn't raise all the money that Tillis needs to pay the teachers, falling about $50 million short. Meanwhile, North Carolina Republicans are on record as opposing all gambling of all kinds, according to their state platform, and they led the opposition to passing the lottery in the first place. Does Thom Tillis even know what his own party stands for? Then a video clip surfaced of Thom Tillis bemoaning the fact that "the traditional population" of North Carolina isn't growing, while Hispanic and black populations are. By "traditional population" Tillis clearly meant white people like him and his supporters. Racial politics? Naaaaw, just a tiny slip of the tongue. Tillis campaign communications director, Daniel Keylin, told Talking Points Memo that by “traditional” Tillis meant “North Carolinians who have been here for a few generations.” Huh? Black North Carolinians have been here for many more than just a few generations, but they were explicitly excluded from the "traditional population." American Indians? They've been here for considerably more than just a few generations, but Tillis didn't mean them either. He meant those white people that he wishes would hurry the hell up and have more children who'll vote for him. I DID hurry the hell up and have children. But they won't vote for him any more than I will. J.W. Williamson was the founding editor in 1972 of the Appalachian Journal: A Regional Studies Review, which he edited until July of 2000. He has taught college classes in Appalachian history, cultural politics, and literature, and he has lectured widely on the pop-culture history of "Appalachia" in the American consciousness. His books include Interviewing Appalachia, Southern Mountaineers in Silent Films, and Hillbillyland: What the Mountains Did to the Movies and What the Movies Did to the Mountains. He has won the Thomas Wolfe Award given by the Western North Carolina Historical Society, the Laurel Leaves Award given by the Appalachian Consortium, a special Weatherford Award given by Berea College, and the Cratis Williams-James Brown Award given by the Appalachian Studies Association. The views expressed on WataugaWatch are solely those of J.W. Williamson or individual contributors and are not necessarily shared nor endorsed by the Watauga County Democratic Party nor by any other adults of sound mind in this or any other universe.